Having too much data can sometimes be as big of a problem as not having enough data. By using filters with your survey data you can look at specific pieces of your data to spot patterns or actionable information. The survey results overview displays the results for all completed surveys and provides a summary of your data. However, you may need to know how a specific group of your survey respondents answered your survey. Any time you need to dig deeper into your data to analyze a subset of your respondents, you can apply a filter. What types of questions can filtering answer? Who are our biggest advocates? Who says they are very satisfied and likely to purchase from us again and would recommend us? Why are they our biggest advocates? Why do they say they would recommend us? Why do dissatisfied customers feel that way? How do they answer our open-ended questions? How do employees in specific departments feel about our company? What are the demographic characteristics of those who purchase my brand? What are the demographic characteristics of those who purchase my competitors’ brands? 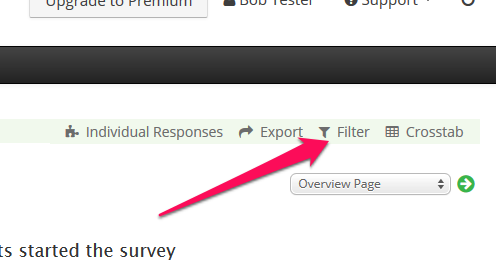 The filtering feature is available to SurveyRock Premium subscribers. If you have a SurveyRock Basic (free) account, learn more about the benefits of upgrading now. SurveyRock also provides you with professionally designed survey templates to help you create a best-in-class survey in minutes. With SurveyRock, you can quickly and easily create online surveys and receive the fast feedback you need to make important decisions. Remember: the information you need is only a survey away!